Corsair has emailed HEXUS about several new PC building accessories it has started to sell. 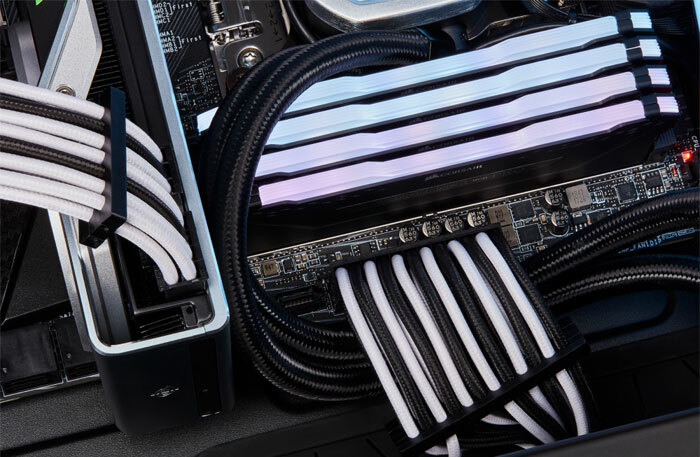 These aren't the big ticket accessories we usually associate with Corsair but premium cables and connectors (in a range of colours), plus its own brand thermal paste. Perhaps you might call them incidentals rather than accessories or components but nevertheless they are, of course, vital to your PC build. 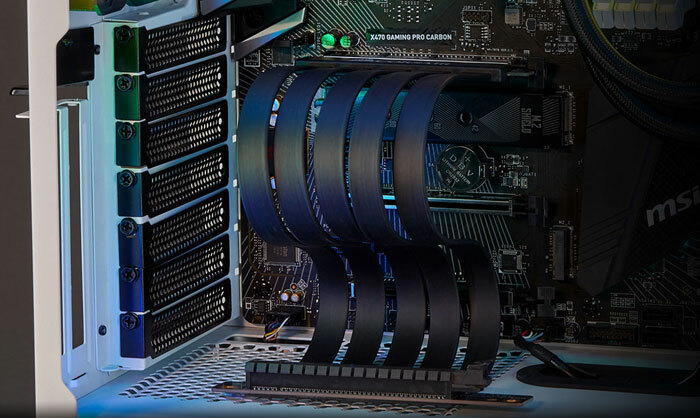 The raft of new products include the Corsair Premium Individually Sleeved PSU Cables, Premium Sleeved Front Panel Extension Kit, Premium Sleeved SATA Cable, Premium PCIe 3.0 x16 Extension Cable, and TM30 Performance Thermal Paste. From the descriptive names of these products there isn't a lot more to say with regard to some of them. 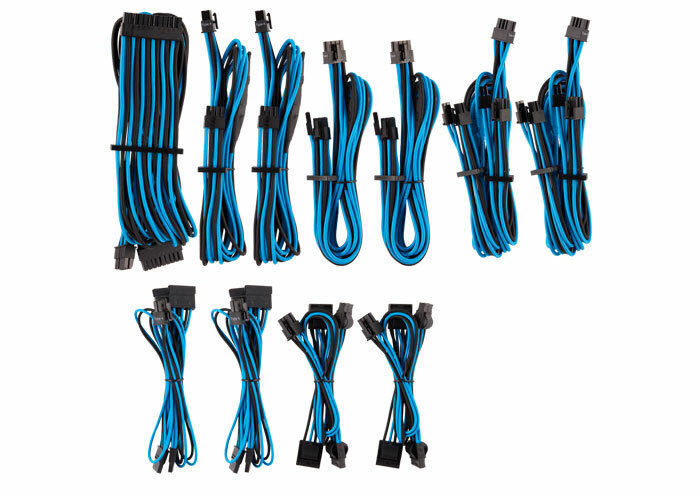 However, the Premium Individually Sleeved PSU Cable kits upgrade your PSU cables to flexible paracord sleeved versions and are available in seven colours. Corsair adds that "in-line capacitors on the ATX 24-pin, EPS12V, and PCIe cables ensure clean voltage delivery for consistent, stable power". The Corsair Premium Sleeved Front Panel Extension Kit and Premium Sleeved SATA Cables (30cm) are available in four colours: black, red, white, and blue. 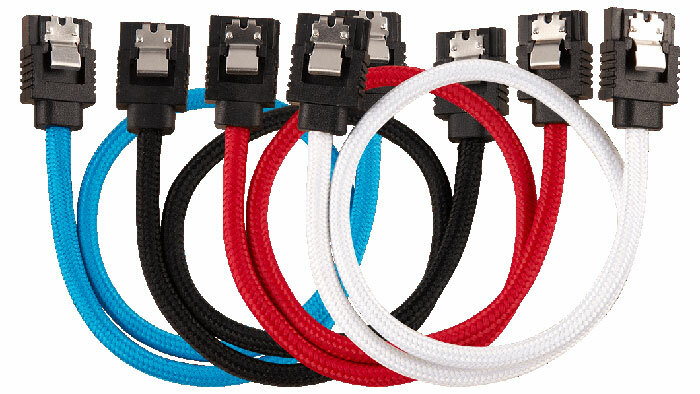 The SATA cables are also available with straight-to-straight, or straight-to-90 degree options. Those that like flexibility with regard to GPU positioning may appreciate Corsair's Premium PCIe 3.0 x16 Extension Cable, offering all the bandwidth and performance of PCIe 3.0 with a generous 300mm of cable length. Those who opt for vertical GPU mounting in chassis such as the Corsair 275R or 500D might appreciate the EMI shielded and five-wire banded flexible cables. Corsair TM30 Performance Thermal Paste is a low viscosity zinc-oxide based compound with ultra-low thermal impedance. This TIM is formulated for years of performance without drying, cracking, or change in consistency. Furthermore, the compound is non-toxic and contains no VOCs. Corsair told HEXUS that all its new premium PC building essentials are available immediately. All premium cables come with a two year warranty. Pricing will vary depending upon your region. Certainly looks like it… I've been after some of these for ages!! Hmm so the Premium Individually Sleeved PSU Cables Pro Kit Type 4 Gen 4 cost as much as a PSU itself and rather confusing info on which Corsair PSU's they'll fit. Does that mean I would be able to use the new cables for my PCIe cards but not for the motherboard?